“As a choreographer, it is gives me great delight to let my creativity drive me to put together a moving and life changing experience for both the dancer and the audience. Dancing is an expression of self for anyone involved in any part of the process,” says Gina Danene Thompson, Choreographer and Artistic Director of PURe Dance Ensemble, an Ann Arbor based Dance Company, which she founded in 2002. Gina Danene has taught at some of the top dance studios all over California, where her choreography was seen on a variety of stages and bodies. She moved back to MI to bring her unique, top of the line choreography to her roots, and takes pride in winning over mixed audiences as they see her creative movement on PURe Dance Ensemble dancers, who perform modern dance, classical ballet, jazz, hip hop, street funk, and Afro Haitian. “Every choreographer has their own style of teaching; my mission statement is to let every person in the audience be able to see themselves on stage in some way, shape, or form during the performance, and, through seeing themselves on stage, be healed, thereby having a cathartic experience,” continued Gina Danene. “To me, the process and end result need to be equally respected, so that both the performer and the audience respond effortlessly to the movement,” says Gina Danene. Gina Danene Thompson and PURe Dance Ensemble will be performing at private and public platforms over the summer, including Thursday, July 22 at 12:30pm Main Stage for the Ann Arbor Art Fair, one of the most widely recognized Summer Fairs across the country. They are also performing on August 7 at 6:00pm Main Stage at the Lebanese Festival, the largest Lebanese Festival in the country. Private lessons, athletic training, choreography for musical theater and concert dance, among a selection of other dance training and choreography services are available by contacting Gina Danene directly at ginadanene(at)puredanceensemble(dot)com or 415.994.4244. Also contact Gina Danene to inquire about live Performances and Master Classes, given by PURe Dance Ensemble. About Gina Danene Thompson: Gina Danene received her dance certificate from San Francisco City College. Gina Danene has taught at some of the top dance studios all over California and her career was unparalleled; she moved back to MI to bring her unique, top of the line choreography to her roots. 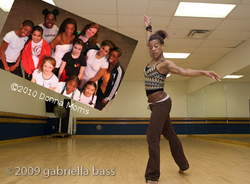 Gina Danene also began her own dance company in 2002, called Project Universal Reflection (PURe) Dance Ensemble. PURe has a children’s dance company, PURe Potential. Gina Danene has taken the Ann Arbor Recreation and Education dance classes to high levels since they brought her on the team, including taking their dance classes into several schools in Ann Arbor. Gina Danene also trains the nationally ranked and award-winning Ann Arbor Hockettes. She is also contracted to teach at the Ann Arbor School of Ice Dance, home to world competitive students, including four who, under her leadership, have been ranked nationally and internationally the last two years, consecutively. Gina Danene also trains the University of Michigan synchronizing skating team, the Ann Arbor Figure Skating Club, and Olympic Medalist Ice Dancers. Gina Danene’s techniques include the Dunham technique, Graham and Horton based Modern, and Afro Haitian. She also teaches classical ballet, jazz, hip hop, and street funk. Gina Danene is also a certified exercise instructor for Pilates, yoga, and dance. In addition to her work as a choreographer and dance instructor, Gina Danene is a mentor for her students. Gina Danene can be reached at: ginadanene(at)puredanceensemble(dot)com or 415.994.4244.